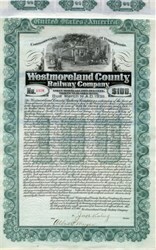 Beautifully engraved bond certificate from the Westmoreland County Railway Company issued in 1907. This historic documenthas an ornate border around it with a vignette of a horse driven trolley. This item has the signatures of the Company’s President and is over 112 years old. Nine coupons attached on top. The Westmoreland County Railway Company connected Latrobe to Derry, Pennsylvania.